When director Ken Russell wanted to take a relative break after filming THE DEVILS (1971), the most political, challenging, and strenuous film of his career, he made THE BOY FRIEND (1971), a meta-musical of Sandy Wilson’s bit of fluffy 1920s nostalgia, as a follow-up. Whatever its faults, THE BOY FRIEND represents a unique creative statement, moving as it does between “reality” and “fantasy” with considerable imagination. It remains an unjustly obscure film, but perhaps this has to do with the shadow cast by the film that came before. When Michael Winner, Russell’s contemporary, wanted to take a relative break after filming DEATH WISH (1974), certainly the most notorious and controversial film of HIS career, he made WON TON TON, THE DOG WHO SAVED HOLLYWOOD (1976), an altogether weaker stab at a nostalgic break. Many revile Winner—for his politics, for the look of his films, for his gregarious character—but I actually admire him. I find his films of the 1960s to be absolutely essential to any broad understand of the British cinema of that decade, and I find his whole career (for its variety, its peculiar consistency) to be worthwhile. That is, of course, until I saw WON TON TON, THE DOG WHO SAVED HOLLYWOOD, a very bizarre and nearly unjustifiable animals-among-us film set in the high, heady days of Hollywood’s late silent era. Down on her luck Estie Del Ruth (Madeline Kahn, slumming it) is a broke aspiring actress. As she heads for an improbable audition, she encounters wonderpooch Won Ton Ton, who recently escaped an impound holocaust (did they actually incinerate unclaimed dogs in the 1920s?) and comes to regard Estie as his master. Estie continues to her bum audition, but catches the eye of studio tour guide and hopeful writer/director Grayson Potchuck (Bruce Dern…was anyone questioning these character names? ), who is able to build a career around Won Ton Ton’s exciting ability to follow commands. Trouble is, Estie only tags along as the “trainer” and not as an actress. The film plays as a broad comedy of ups and downs, as Estie eventually becomes an actress in her own right, Won Ton Ton gets separated from his “family,” and Grayson rides the cruel wave of success. 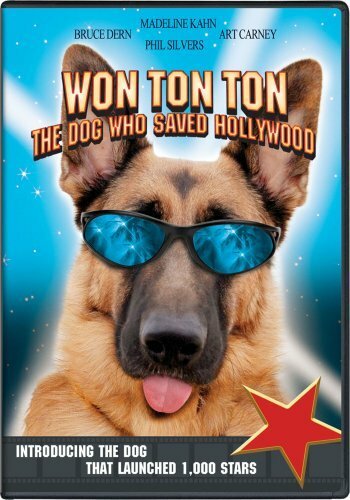 The real star of the film is Won Ton Ton, a loveable German Shephard who easily steals every scene he is in. Since neither Kahn nor Dern chew too much scenery in this one—both do much better turns in much better films—the other reason to watch this odd period piece are the nearly inexhaustible number of Hollywood cameos. Here, Dean Stockwell is a relative youngster, with most of the delights coming from stars whose luster has long-since faded. You might want to have your copy of Kevin Brownlow’s THE PARADE’S GONE BY handy, or your old gossip magazines, because this film boosts an unbelievable number of guest spots: we’ve got everything from one of the original Keystone Kops (Edward Le Veque) to Dorothy Lamour. The film is therefore recommended for fans of classic Hollywood cinema, if only to stare in amazement as favorite actors stumble into weird cameos. There are better periods films of this era—Russell’s VALENTINO (1977) and the notorious INSERTS (1974) are two very different takes on the time, and much more “adult”—and there are better Michael Winner films of the 1970s. Too old-timey and occasionally downbeat for kids, too lame for most grownups, WON TON TON is fun in title only.